Homemade Italian Meatballs are chock full of fresh and wholesome ingredients, always a big hit at our house. Spoon over spaghetti and pasta, or stuff into a toasted sub roll with melted provolone. 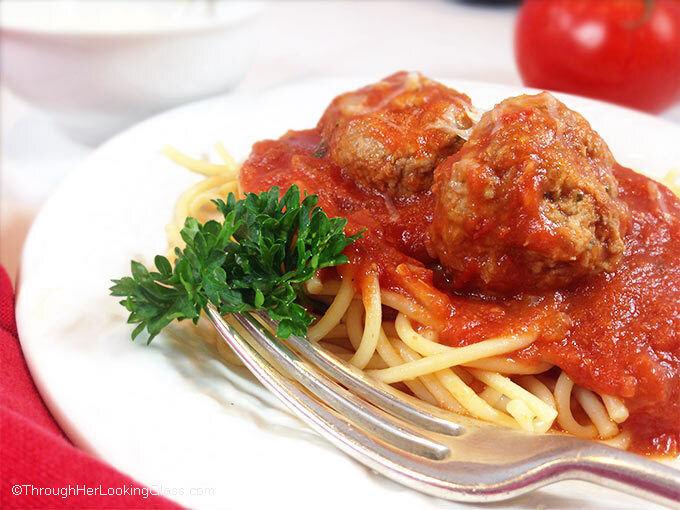 Homemade meatballs are a great main dish everyone craves. While I may not have a drop of Italian blood in my veins, that doesn’t mean I don’t love me some good Italian cooking! And my earliest memories of authentic Italian meatballs come from my growing up days in Rhode Island. One job I loved was unlocking the soda vending machines on the property. I collected the coins inside, then counted and rolled them into paper sleeves to take to the bank. The best part? My dad always let me pick a soda while I was collecting from the machines. Fanta root beer. That’s the one I always picked. We rarely had soda at home so it was a big treat. The irony is, I was usually going in with my dad because our dentist was nearby and my dad was bringing me in for my six month appointment. (Ahem.) Too funny. I don’t remember mentioning the Fanta to Dr. Ramos. Yep, I got a little sidetracked going down memory lane. I do that. Meatballs. At lunchtime we frequented one of two places: Friendly’s or Ricotti’s Sandwich Shop. Ricotti’s was just down the street at 11 Gooding Avenue. That’s where we ordered the fresh Italian meatball subs I remember so well. Only we called them grinders. Oh they were good. SO good. Soft, fresh baked grinder rolls stuffed with savory Italian meatballs, smothered in the best sauce with melted provolone. Best. Lunch. With dad. Ever. This mouthwatering Homemade Italian Meatballs recipe reminds me of those Ricotti’s Italian meatballs made with fresh ingredients: garlic, parsley, Italian bread crumbs and freshly grated parmesan to name a few. These Homemade Italian Meatballs are quick and easy to make and your family will love them too. Grab your fork and let’s mangia! 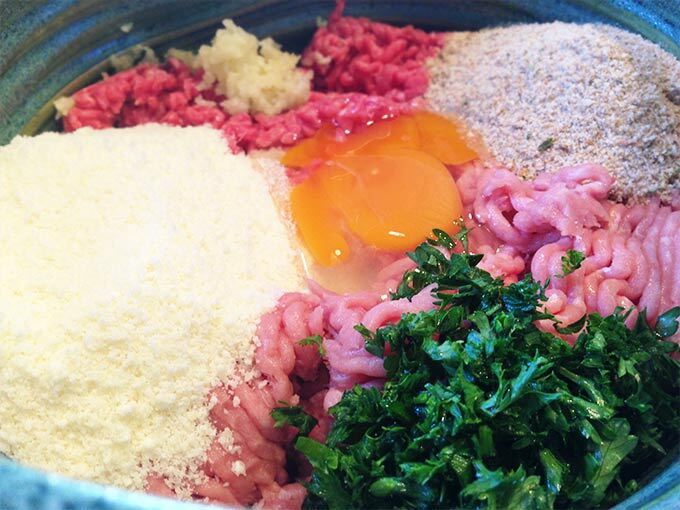 Use ground beef or a mixture of ground meats like ground turkey, ground beef, ground veal or Italian sausage. Grate fresh parmesan and romano cheese over meatballs before serving. 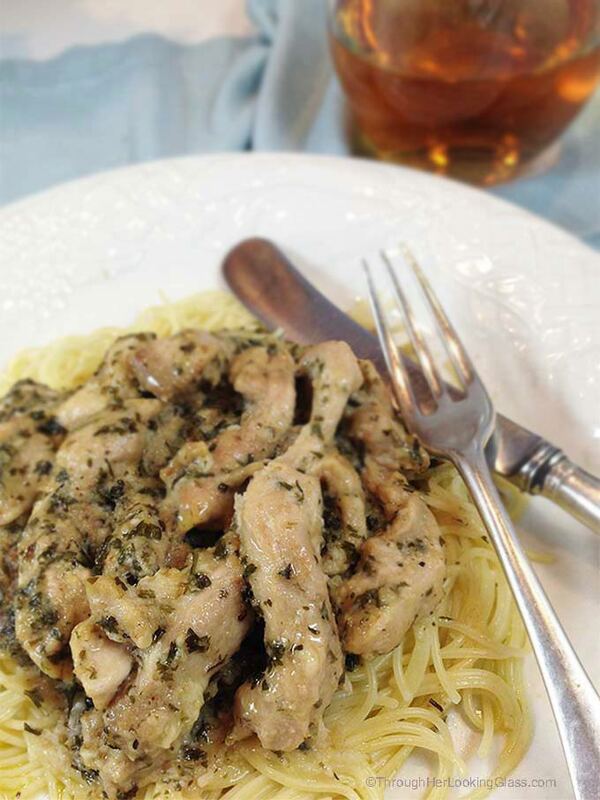 Use fresh garlic, freshly grated cheese and fresh parsley for great flavor. Serve over spaghetti or pasta, or stuff into toasted grinders for meatball subs. Make these ahead and freeze the meatballs, then drop into the simmering sauce as needed. 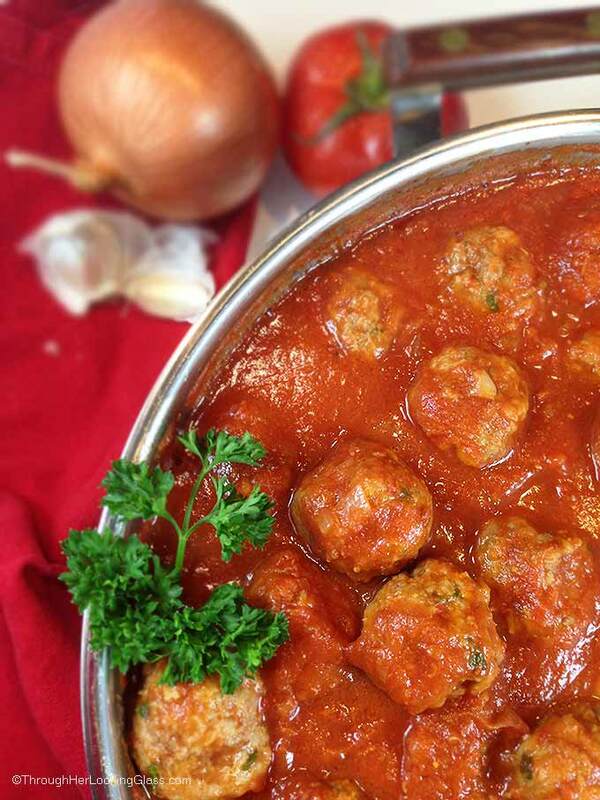 Savory, tender Italian meatballs with fresh garlic, parmesan, flat leaf parsley in a delicious simmered tomato sauce. Heat olive oil in a medium sauce pan over medium heat. Add chopped onions and 2 cloves of crushed garlic. Stir in tomato sauce, crushed tomatoes, salt and pepper. Cover and let simmer on low for 15 minutes. Put ground beef in a mixing bowl along with 2 cloves crushed garlic, bread crumbs, egg, chopped parsley and parmesan cheese. Combine with your hands or a fork. Form into tablespoon size meatballs with hands or a 1 tablespoon cookie scoop. Carefully add meatballs into the simmering sauce. Cover and continue simmering for 15 - 20 minutes until thoroughly cooked and meat is no longer pink inside. Serve hot over spaghetti, pasta or on sub rolls as a meatball sub. Looks delicious! your pictures are beautiful too Allie! Since you have become my "go to for new recipes" & I am half Italian, I can't wait to try this recipe! & I agree with Cynthia, your pictures are beautiful! Allie, just like you, I have ZERO Italian in my blood--but I wish I was Italian! I love Italian food and meatballs are one of my comfort foods. Can't wait to try your recipe! Stunning pictures! These look absolutely delicious! I don't remember the last time I made meatballs. This is certainly motivating! They look scrumptious! Love all things Italian and meatballs especially! Can't wait to try 'em! "let’s mangia!" indeed Allie, these meatballs sound fantastic! I love the combo of turkey and beef in them! And, I love the memory behind these. Your dad letting you have a soda as you went about your favorite job there before your dentists appointment is a far cry from what my parents did before my dentists' appt - they would make me brush and gargle - I used to think - well, isn't the dentist gonna do that anyways? :) Happy Thursday my friend! My mouth is watering as I read this. These look amazing. I can't believe this but I've never made meatballs. I'm looking forward to trying these soon, over zoodles, (zucchini noodles). I LOVE meatballs and these look delicious. Your pictures are wonderful. I used to always make our spaghetti with a sausage sauce, but I realized how much I love meatballs. You've given me a huge craving---yours look divine!! 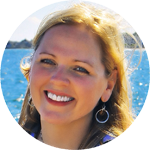 I also loved the story about going to work with your dad and having a special lunch together! I just made meatballs and sauce! Turkey and beef also. I used all of the same ingredients except for the fresh parsley. Yours look better!! Great meal for a whole house of boys!! Yum!!! 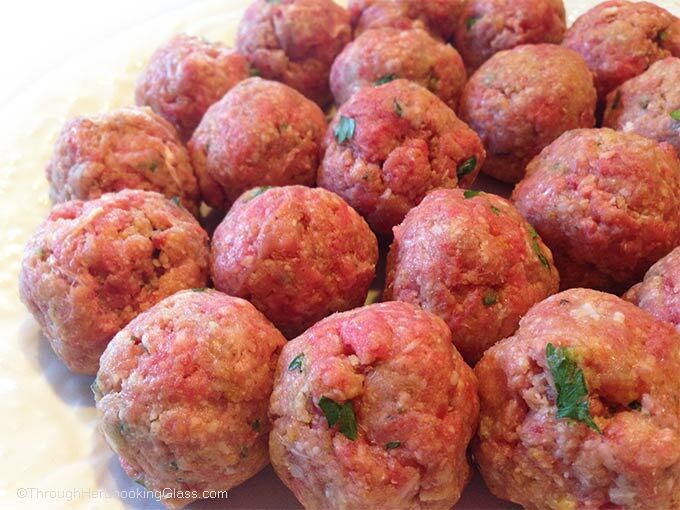 What great memories you have of working with your dad :) I'm a meatball lover and these look fabulous! Every day is a good day when meatballs are involved!! This looks amazing! One of my favorite dinners. these came out perfectly! 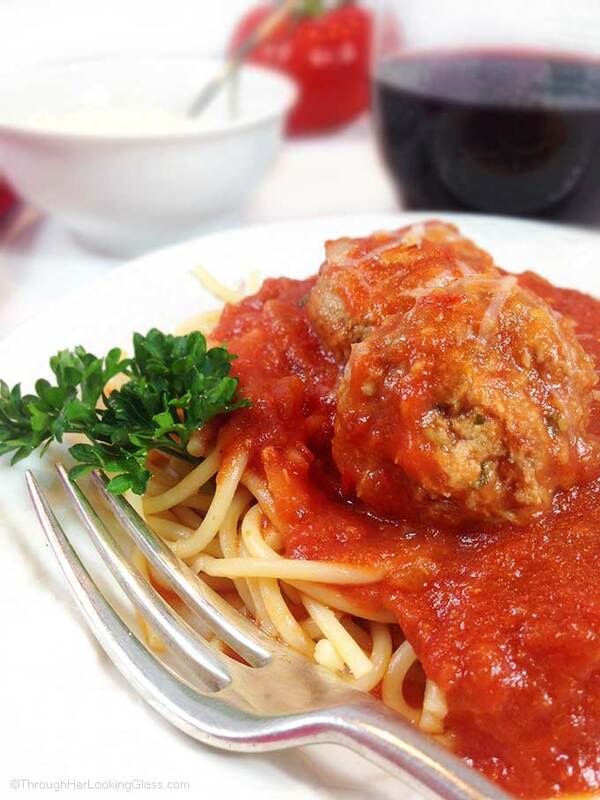 nothing like classic spaghetti and meatballs. Well since I have never been able to master the cooking art of making a meatball that stays together AND tastes delish, I am going to try these! Trying out your blog recipes is making my friends, family (and ME!) very happy! I"ll take all the meatballs please! Such great memories! I love Italian meatballs. They are total comfort food for me. I don't have any Italian in me either, but that doesn't mean we can't love 'em or know how to cook 'em! Your recipe looks absolutely delicious! Funny...I was just thinking about Italian meatball subs the other day and now here you are writing about them. 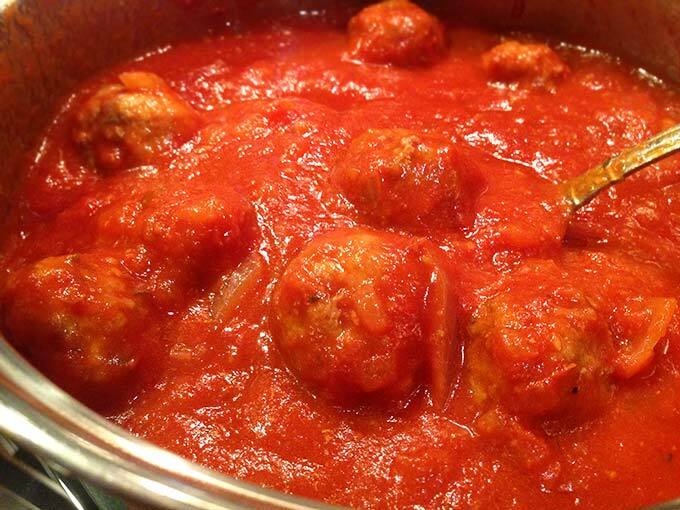 Your meatballs simmering in the sauce look great.